Send one to a friend! 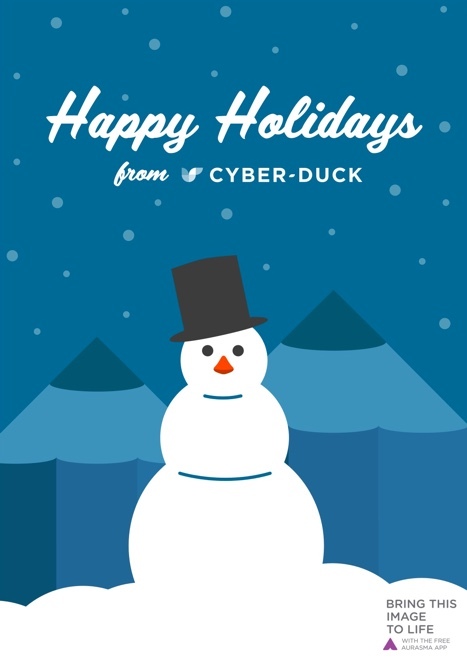 This year, Cyber-Duck is taking Christmas to all new dimensions. With the power of Augmented Reality (AR), you can make our #CyberSnowman burst out of your screen! Give our interactive card a go with these quick, easy steps. Here's how our friends reacted to the 3D Christmas scene. Download the free Aurasma app onto your smartphone. You can find it with a quick search on the App Store or Play Store. Open the app. Sign up for a free account with a few easy steps. Skip creating an aura, if asked... we've already done that! Use the searchbar to find Cyber-Duck. Tap our profile and hit the follow button. Hit the [ ] button to head back to Aurasma's main photo interface. Point your phone camera at this Christmas card website. Enjoy our design - can you spot our team?